I've been at this for years and I still haven't settled on a stable set of apps and workflow(s) for keeping and processing notes. Part of the reason is that different apps and workflows seem to be better suited for different kinds of notes, but I've never really sat down and rigorously analyzed what kinds of texts I deal with under the broad umbrella of "notes". I started doing that today, and I'd like to share what I've got so far in hope of sparking a discussion. Am I missing any categories? How can I (or should I) better systematize my workflows around these categories? I'm also wondering exactly where David Allen's distinction between project support material and general reference material fits in. Probably the largest class in terms of sheer volume, this is basically anything I run across that I save because it just might conceivably come in handy someday. A lot of it is web pages I've saved using the Evernote web clipper. Notwithstanding what Christian has written about the Collector's Fallacy, I contend there's quite a lot of information that's worth storing (so it won't be lost if a web page disappears, etc.) in a place that's accessible if I ever need it but out of sight when I don't, but not necessarily worth devoting any further attention to unless and until I actually do need it. I'll probably stick with Evernote for this, mainly because nothing else comes close to its web clipper. I've been using Tiago Forte's progressive summarization technique to digest texts that I want to use either as learning material for skills or projects or as source material for writing. I lean much more towards Tiago's idea of just-in-time note processing, devoting the time and attention to a particular document as and when I need it, rather than Sascha's approach of thoroughly zettelizing a text as a one-time effort so I'll never have to engage directly with the source material again. DEVONthink for processing, but I haven't really been consistent in using it. I also use Skim for reading and annotating PDFs, and I've played around with things like MarginNote. I think of these as atomic units of near-ready-to-publish writing, corresponding roughly to Tiago's Level 4 or 5. Some of them could potentially be published individually as tweets, others structured together at increasing levels of complexity as blog posts, articles, white papers, books, etc. The Archive, but I'm nowhere near critical mass for "communicating" with my Zettelkasten yet. The first three categories form a sort of linear sequence (but really more of a funnel since comparatively little material actually makes it all the way to the zettel stage, much less to the published document stage). These are notes I jot down while working on a project that I don't expect to be of any use once the project is finished — dimensions, definitions, choice of synonyms for consistency in a translation, page references, code or API syntax, that sort of thing. Sometimes I like to keep a step-by-step record of my actions on a project, in case I need to trace errors or repeat or improve the process in the future. This category could be considered a more rigorous and permanent version of the working notes category. It also includes weekly and other periodic review logs. Information that can be useful in practical terms and worth keeping but will never be incorporated as such into a project. Bus/train schedules, prices, recipes and similar instructions for closed-ended tasks. Thoughts and ideas that I want to capture for incubation. Some of these may also feed into the zettelization funnel. @Eurobubba do you journal? These would be notes to a future self. Thanks for the knock to think about the "types" or modes in which I make notes. DIscovered Zettelkasten via Sönke Ahrens's How to Take Smart Notes which lead me here and to THE ARCHIVE. I've been entranced by Christian and Sascha's work here. Fallen down the proverbial rabbit hole. 244 notes since 8/Nov/2018 average 3 per day. Came to this most for reading retention but am staying because I'm finding this useful for blog posts, writing practice, and knowledge building. I use paper and marginalia for rough 1st and sometimes 2nd editing of a zettel being careful to have one idea - one note. I've been thinking about this some more today and I think I want to change the category of "Project Logs" into "Project Notes", with logs as one type of note within that category. And DEVONthink is probably the place to keep them. For the "Jotted Ideas" category I'm inclining toward Drafts. I should probably think of the category as a universal text inbox, with stuff worth keeping eventually being channeled into "Notes in Process" or perhaps (if it generates actions/tasks) into OmniFocus. So if the Drafts for Mac beta already had the "actions" functionality of the iOS version this would be a no-brainer. Judging by the pace of development and the developer's stated priorities, however, it looks like it will be many months before actions are available on the Mac, so I may just roll my own with Keyboard Maestro instead — in which case it may make more sense just to use BBEdit's Scratchpad feature instead. Working Notes probably also belong in Drafts or Scratchpad; then once I'm done with them I can decide whether anything is worth saving to Project Notes in DEVONthink or just delete them. 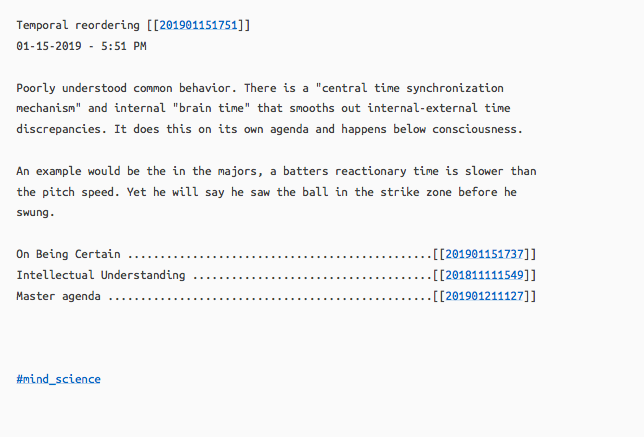 Maybe Ideas and Working Notes should be combined into a category of "Jottings" that is understood to be ephemeral. I'd like to challenge such an divide between so many different types of notes. There are only to types of notes left in my archive: structure notes and content notes. This is because I do different things with them. I connect and I write. But they are both in my archive because I just write to generate both of them. The sole reason at this point that I don't store whole articles in my archive is that small notes are more feasable for searching and linking. But I copy them in the archive and break them up if they were not derived from already archived notes. That leaves me with just one environment for knowledge work in general (The Archive), one for writing (Writer) and one for self organisation (Emacs). The result is what you seem to search: A streamlined and lean work flow. The method of streamlining is getting rid of many for the benefit of the few. There are only to types of notes left in my archive: structure notes and content notes. Well, those are two types of zettels. But surely there are also other types of notes. It's not only the zettelkasten process that I've been thinking about here. I'm assuming you'd agree that The Archive is not the place for all of those types of notes. Are you saying you copy articles into The Archive before reading them? Maybe some of them fall under your Emacs self-organization category. Project Notes (for non-writing projects) and Practical Reference Notes are not part of that workflow. @sfast I've come around to thinking that content is content in its various forms. I can treat it all the same. Chunking it up into small one idea - one note. My archive is full of the content of my knowledge project. I've bent to my old thinking and created a few of what I call "summary" notes. These turn out to be glorified table of contents. These notes are usually centered around a book or paper. I structure them as much of a thoughtful list of links to the 'content' notes with short abstract, tags, links to external source materials. What is the difference between my "summary" and your "structure" besides the name of the note? Ah, you are distinguishing between notes and zettels to make a point. I don't distinguish because I only have notes related to my one system. I have structured list in .org for links. But those doesn't count as notes. No. Either those things are in my inbox, in the process of getting processed or thrown away. I copy my own articles in my archive. The ones I wrote, not the ones I read. I am a minimalist with no head space for complicated work flows. Can you make a screenshot or two? Perhaps, there is not much of a difference. In fact, would be suprised because I believe that there is only structure and content (or form and matter) in any system. Thanks, @sfast for your explanation of your workflow. I have greatly simplified my thinking about what constitutes a note and at the same time becoming more freer in what I'm including in each note. Not differentiating between notes but going with what captivates at the moment. This takes less cognitive horsepower and focuses more on the content. 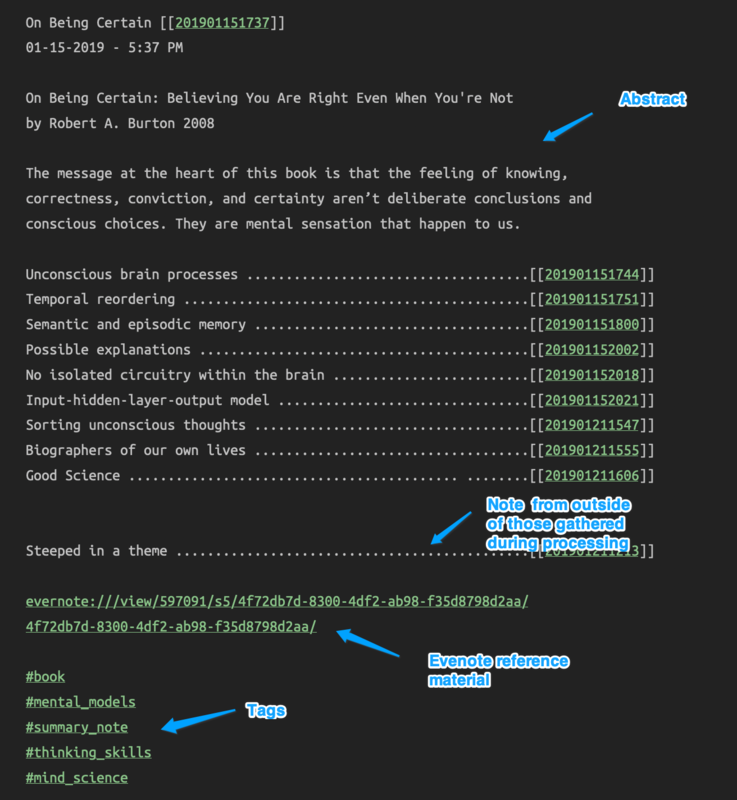 Here are a couple of screenshots of summary notes. Thank you for the example images above. Would you mind showing one of the linked sub-topic notes? I'm just curious about how you write that content. Links at the bottom are a backlink and 2 relevant notes. One idea - one note. Nothing fancy. A couple of notes are just a short pithy quote. But most are like this, my take of what what the author wrote. All these summary notes and their subnotes are the result of my processing written or lecture matterial. Books, papers, audiobooks. I end up with more than just Zettel, too, because I consistently fail to think straight until I write it down. Figuring things out: Of course I keep A4 paper on my desk to jot down ideas and sketch programming things before I code; but that's ephemeral, and does not even reach my inbox. It's thrown away when the page is full. Sometimes I copy diagrams for reference in my coding project directories, but that's seldom the case. 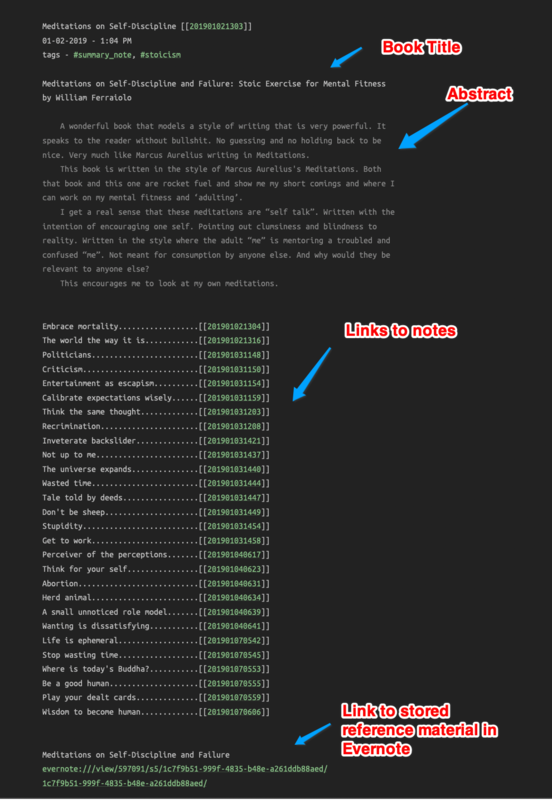 Project notes/logs: These aren't "learnings" or anything I want to keep. They are notes on tasks in my task manager. When I tackle complex tasks or features, I write down what I learn ("this function X really does Y so you have to call it from Z"). Some findings I turn into Zettel notes for later reference, but most of the stuff is just to help me backtrack when I reach a programming dead-end. Lists of ad hoc shell commands I need to copy & paste over the course of days to test something. Outlines with battle plans when I run into obstacles. I write these down in Emacs/Org. That's a rehash of the GTD flowchart, by the way (you can find it everywhere on the web, e.g. here). I focused on the path from inbox to reference in the "Building Blocks" blog post, by the way. Like Sascha, I try to keep only 1 digital reference system. ¿Can/should I merge my Jottings and Clippings inboxes? If I stick with Evernote as my capture point, then I can. Evernote is ideal for Clippings, and I could use the Quick Note feature for Jottings as well. But it's not good at Markdown or a lot of other advantages of plain text. Conversely, Drafts, BBEdit, and other potential text-centric capture points aren't good for whole web pages or PDFs. Basically I'd be making a Jotting of a link, description, and/or excerpt and I'd still have to have a separate place to store the PDFs. So maybe I should go ahead and keep them separate, but that muddies the waters because Evernote also (at least for now) has a role as a reference repository. I guess I could learn to live with that and deal with my Evernote _Inbox notebook the same way I process my e-mail inbox. I can probably merge the Project Notes and Notes in Process categories if I consider writing to be one among many potential kinds of projects (with the Zettelkasten as a tool I use for writing projects). What I'm calling Project Notes and Practical Reference Notes correspond to Project Support Material and General Reference Files respectively in GTD. Maybe the simplest approach here is to keep them in the same app or repository and just use a project identifier to tag the ones associated with a specific project. On the other hand, there are lots of kinds of reference material that I know right away that I won't ever want to zettelize or otherwise process. I just want them handy when I want to look up the information. And that's another function that Evernote seems best suited for. If I knew what part of which current document was key to future use, then I’d not need a Zettelkasten at all. (Think of the time savings with no digesting.) Opportunity costs are difficult to calculate here. Considering the nature of knowledge work, determining the relevance of an idea in a "digest [of] a source document" is beyond my pay grade. And of course, there are the vagaries of the future. I vote for keeping Evernote for the Clippings, PDF storage, and all the other use-cases where Evernote shines. Especially if you like me already have a mass of Evernote notes. But for serious knowledge work and as a writing partner, I’m sticking with my slowly growing zettelkasten archive. Trying to keep it independent, as much as possible. Thank you @Eurobubba for stirring this pot. For some reason, I’m attracted to the meta-analysis and discussion. It has really helped me simplify and not worry. 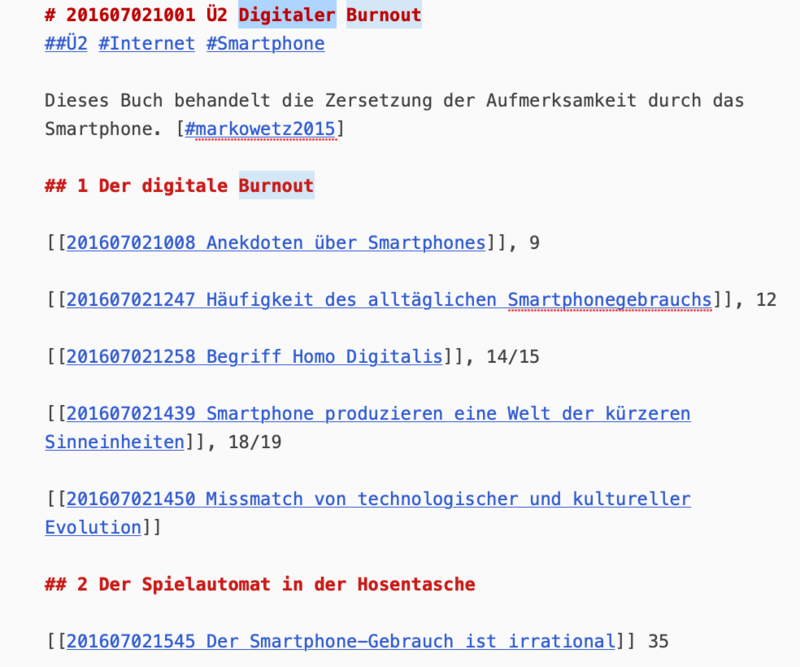 I forgot to attach the picture of my org file for The Archive regarding a better Markdown highlighter, where you can see a mix of TODO items, sub-task (- [ ]), research and commentary for my future self. @Will It looks like that you have a structure note that is orientated towards a book. In my opinion, it is a structure note. In your case with a bit lack of structure. I prefere a structured list over just a list. I am flirting with this idea of having Evernote as sink (I wouldn't even call that an inbox). But now I hesitate because it feel like cluttering. I have the links in my research.org and often jottings, too. It reminds me with my tabs in firefox. They accumulate and make me anxious (dramatisation). But I refuse to just delete them. But sometimes there is a purge (e.g. system crash). I am a bit annoyed and overwhelmingly happy with the decluttering. @sfast a quick question: I'm trying to come up with my own searchable distinction between structure notes and content. I know you use the Ü as a signifier of a structure note, is the 2 meaningful in any way? Is there a Ü1? Of course Luhmann was working in an analog world and wasn't addressing the issue of DEVONthink vs. plain text. As far as we can tell from that brief quote, he does seem to be recommending getting content into the Zettelkasten quickly instead of keeping semi-processed source documents around. But I'm guessing most of his source materials would have been books and papers that wouldn't have fit in his physical Zettelkasten even if he had been inclined to put them there directly (presumably dog-eared and highlighted with lots of margin notes). 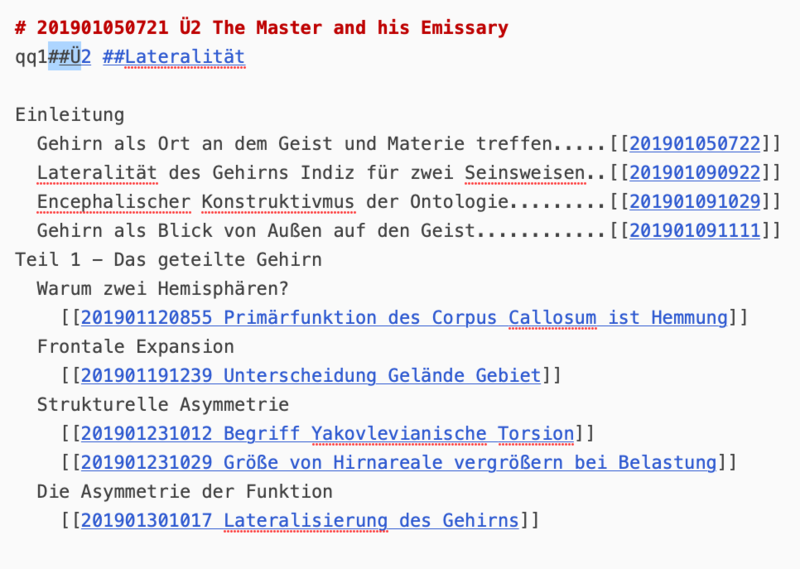 I may have to think about it some more, but right now it still seems useful to be able to keep highlighted but not yet fully abgeklärt PDFs in the system, with some separation from zettels written in my own voice, even if I may still want to revise the zettels further. Sink, buffer, slushpile, inbox overflow, junk drawer — I think people in the productivity and knowledge management space are beginning to see the need for a place to keep material that's been flagged as potentially interesting but without any commitment to ever actually processing it, and without guilt if it's still there untouched six months later. Then whenever you do have time to browse, going through a slushpile may not give you the dopamine hit of novelty that you can get from unfiltered outside input streams, but since it's pre-curated it's somewhat more likely to actually be valuable. @sfast Thanks for sharing those screenshots of your structure notes. They prompted a thought about something I've been wondering about but have not heard you address. I've noticed that in some structure notes you have the entire ID and Title as a link, and in others, just the ID. Regarding just linking the ID I recall you saying that you only use the ID because the title of the Zettel might change (and you can do so without disrupting the ID link). However, I don't recall you ever addressing why you link the entire ID and title. Is this a type of meta-structure so you can immediately identify what has been processed or not? If so, what type of processing? So, for example, in your screenshot of, The Master and his Emissary, what is the difference (structurally and in your workflow) between ID [] and [[201901120855…]]? A good practice or not, I'm relaxed and who cares. This is what I'm doing. Thanks for clarifying. You don't have to be fluent in the "productivity and knowledge management space" to sense more value in self-curating your information streams. Most of my streams are from RSS feeds and have been curated once, then I do inital capture as a form of curation, then each nugget of information gets a third look when I Zettelize it. Keeping a reference back to Evernote seems important. Using Evernote for this 'garbage collection' is a pretty good choice, better than most. Evernote's speed of capture and offline capabilities being the focus. I hadn't thought to relate the dopamine hit of novelty to the slush pile of note in my Evernote inbox. Nice. Yes. "Ü1" means a structure note of top order and "Ü2" is a structure note of secondary order. Those are my central structure notes. I maintain this distinction inspite of doubts that it is useful. There is a great chance of me ditching the seperation. No. Luhmann stressed that he never touches a text twice if he is not forced to. He and me share the same reason: It is just not worth the time. The reason is not the physicality of his Zettelkasten but rather that he felt that he needed to be hyper-effective because of his very ambitious project. I have a place for things without any commitment to process it: The trash. No intetion. When the ID and the titel is in double-brackets I have not fully polished the note. The goal is to only link to ID because the title may change and break the link. Do you have a different understanding of what you quoted, then? Or are you saying that he's only referring to situations where he's forced to put off examining and deciding about not-fully-digested notes? Nice! I capture notes in a similar way. I'll have to try this. I know this from one of his interviews. I may have misunderstood why you offered the quote then. I've been thinking about the Abklären and Prüfen and Entscheiden here mainly in terms of elaborating individual zettels. Is your understanding, then, that Luhmann was referring more to how they relate to his other zettels and where they fit into the overall knowledge structure? The problem I have with deciding in advanced what to process and what not is: You don't have any valuable information on how to decide. You just can decide in the context of a clear cut project. But then you create a ever growing number of open loops. If you process thoroughly you don't touch the text a second time. Hence, if you stumble opon it you can ignore it in your research. This is one of the benefits of not only put "abgeklärte" notes in your archive. The problem I have with deciding in advanced what to process and what not is: You don't have any valuable information on how to decide. You just can decide in the context of a clear cut project. But then you create a ever growing number of open loops. It's not an open loop if you have no particular commitment to ever revisiting it (but it's there if you ever need to). I'm guessing part of the difference in our perspectives is the degree of focus in what we choose to read in the first place. I like to browse broadly; I get the impression you generally know exactly what you're after before you start. You are so right! I've tried the web clipper in Bear, Joplin, and a few others, but only Evernote's web clipper consistently clips web pages accurately and without the need for excessive cleanup. I'd love to stop using Evernote but I won't do that until Bear, my overall favorite notes app, has a web clipper on a par with Evernote's. My web clipping process is to use the Bear web clipper to clip a note into Bear. If the note looks alright then I'm done. If it doesn't then I'll clip the note into Evernote and then export the note in enex format. Then I'll import the note into Bear. When I compare the same webpage clipped with the Bear and the Evernote clipper I often find that the Evernote web clipper produces vastly superior results. There are a number of browser extensions which save a page in markdown format. 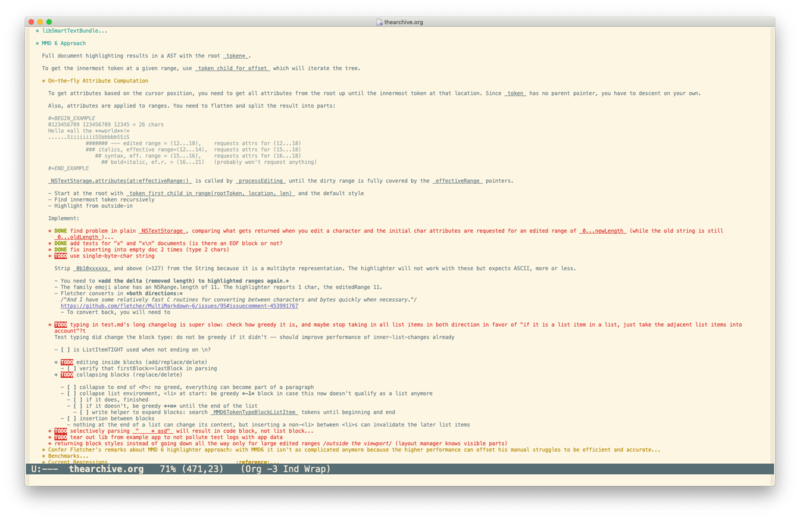 I'm not actively using one any more (I now replicate that functionality in emacs) and I recently purged my extensions, but I had something for a while that I used to collect pages in markdown form that worked really well. I do recall that there was an nvALT extension which did this well but I suspect there are others. I don't mean that it is open because it bugs your mind. But you'll have to re-read it and process it a second time. If you don't finish anything everything there will be no texts that you can reject fast. I don't think so. At least, I don't have the feeling that I know anytime that I am after something. I am always suprised. But you'll have to re-read it and process it a second time. If you don't finish anything everything there will be no texts that you can reject fast. That's where Tiago's progressive summarization comes in. Some texts I'll have captured but not read yet at all. (I know, Collector's Fallacy — except that I'm quite aware that these items are unprocessed. Because I know they're items I've elected to save, they're still more valuable than random Google hits.) In others I may have skimmed and highlighted salient passages, but decided against investing the time to process fully because it's not needed for whatever project I'm currently working on — but the highlighting is there to help me focus in the future if and when the material turns out to be of interest for another project. Eventually, if I ever do use the material in a writing project, I'll fully zettelize it on a "just-in-time" basis.